It can minimise the cost of backing up and recovering your data. You can feel safe and secured from all vulnerabilities for your personal data. Safeguarding your business (and livelihoods) can be so simple with an effective backup and quick restoration process in place. Protecting you from experiencing the frustration and subsequent costs of losing data or your business grinding to a halt, is important to us. Our Backup and Disaster Recovery (BDR) solution ensures your data is protected and secure with services ranging from a simple file/folder backup of your laptop files to complete application and server (virtual or physical) backup with off-site storage or synchronisation to USB. Backup is continuous and fully encrypted with dual copies of data stored securely in a local, UK datacentre. Because backup to a local server isn’t necessary this keeps costs down. Files and folders can be recovered in minutes over the internet and if a full server recovery is required this takes only 48 hours. Backup of all data and applications is via a 15 minute snapshot, fully encrypted and monitored 24/7 by our server monitoring platform. It is also possible to have an extra failsafe and reduction to business interruption from server failure by opting for an off-site standby server; a failed off-site server in the data centre can be quickly started on demand. This option is similar to the one above however, offers the perfect solution to backup, synchronise or replicate your data to an encrypted, removable USB storage device without the extra cost of storing at the data centre. In fact, this is suitable whether you have physical or virtual servers giving the added option to backup locally and replicate data either to USB or if required, at the data centre. 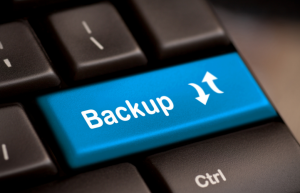 Our backup services are flexible and can be adapted to your business needs just give us a call. We can help to protect you against business downtime.